The knowledge in this book is solid and mostly well-written. Terms are defined clearly, concepts are described specifically and with examples, and there's even a splash of humour here and there. It's by all means a good book. Unfortunately, a good book does not always translate into a competent audiobook. 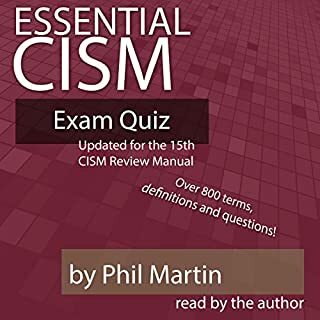 Phil Martin is a fine writer but a poor narrator. He starts the audiobook by stating that he chose to read the book himself, and not hire a voice actor, because he was afraid of mispronunciation. Unfortunately for him, that's the watermark he'd be judged against for these 17 long hours. Martin's Texan drawl is charming enough but if English isn't your first language you will definitely struggle with his accent ("and" is "eeyand", "right" is "rat"). Aside from outright mispronounced words ("high-archical") and technological terms (warez should be "wares" but he pronounces it "wor-rez"), he doesn't know how to vocally emphasize the important parts of a sentence. For example, when conveying the distinction between two easily-confused risk analysis concepts he frustratingly talks about "qualiTAtive versus quantiTAtive" (instead of "QUALitative versus QUANtitative"). Cohesiveness is another problem. 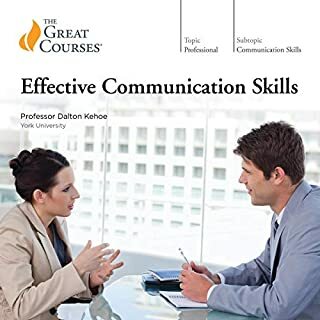 The reading and tone are inconsistent from beginning to end, with the author starting out with clear, deliberate enunciation but gradually easing into a conversational tone (either would be fine, but pick one!). The editing is also distracting; this audiobook is updated for 2018 but new sections have been sloppily grafted in with an awful microphone, transitioning between wildly different recording qualities and sometimes straining my speakers when the letters P and S are spoken. About halfway through the book the editing becomes even lazier where he'll read a few words, stumble, and start over again. These are all details a professional editor would have caught. Some people may find these technical criticisms inconsequential but I found them critically distracting. After a few hours I was ready to request a refund from Audible. 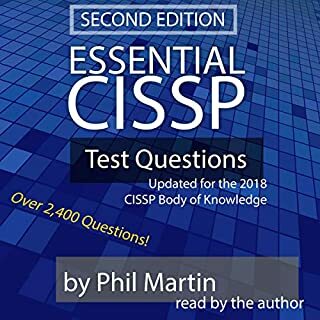 Unfortunately there were no alternative CISSP audiobook study guides so I stuck with this one. I tolerated this audiobook. The amateurish production constantly drew attention to itself and made studying a lot slower and harder than it needed to be. 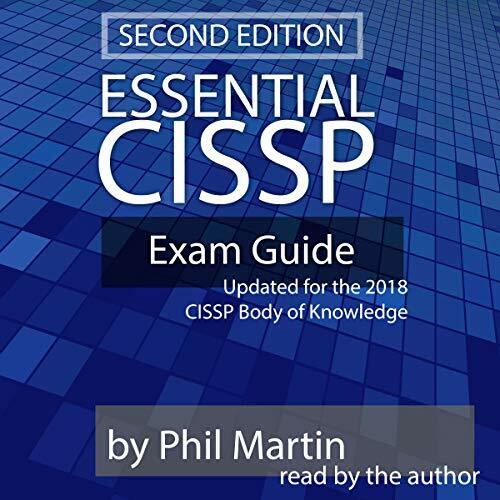 My recommendation is to only use this as supplemental study material - take a class or read the ISC2 book first. 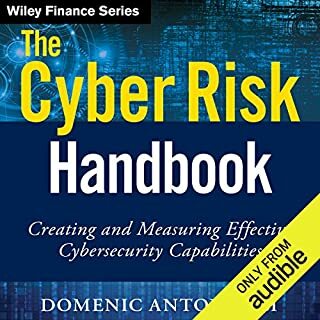 I bought the audiobook version and after a few minutes of listening, I was hooked. I then bought the printed version also. The author explains the concepts, ideas and terms in a way that makes the most sense and easy to understand. I also like the way he makes the special sound effects when reading bullet points or switching topics. 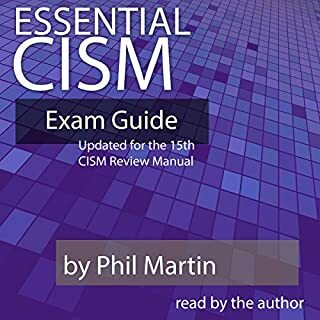 I listened to this book in preparation for the CompTIA exam (yes, not the exam it was intended for) - very helpful with a lot of great examples.... great for someone like me who is a novice in the field. Besides all of that, the author has a sense of humor that made me laugh aloud a number of times and really lightened the mood for serious study. I recommend this book highly! The audio quality of this recording is really tinny. It sounds like it was recorded with a built-in laptop mic. It’s bad enough that it’s hard to understand when there’s any kind of ambient noise. There are also a number of bad edits where a sentence is chopped in half. It’s hard for me to judge the actual content given this, but I do wish there were more examples. The content feels like a list of terms to memorize at times. I’d like more memorable treatment on all of the acronyms. It’s only as a career IT professional that has made me ready to understand what’s going on in this book. 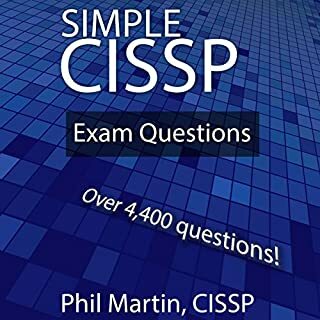 This book alone does not prepare to serve as a CISSP; perhaps pass the test, I don’t know yet. I do appreciate that the scope of the test subjects are laid out.